This week’s notable number is 6 — the number worn by junior wide receiver Devin Duvernay, who caught a 39-yard touchdown pass in last week’s loss at Maryland. Texas has retired six jersey numbers — Vince Young’s 10, Colt McCoy’s 12, Earl Campbell’s 20, Bobby Layne’s 22, Ricky Williams’ 34 and Tommy Nobis’ 60. Linebacker Anthony Wheeler compiled six tackles after sitting out the first half last week (but more on that in a bit). Six also represents the number of targeting penalties that Texas has drawn since 2013. Ahead of that 2013 season, the NCAA began taking a serious stance against targeting, or illegally hitting a defenseless player above the shoulders. Now, in addition to a 15-yard penalty, a player who draws a targeting penalty also is ejected. And if the penalty comes in the second half, he also must miss the first half of the next game. Wheeler missed last Saturday’s first half because he was tossed from the 2017 Texas Bowl for targeting in the fourth quarter. Steve Edmond was the first Longhorn to draw a targeting penalty; the linebacker missed the fourth game of the 2013 season. The Longhorns have had a player ejected for targeting in three of the last four games. 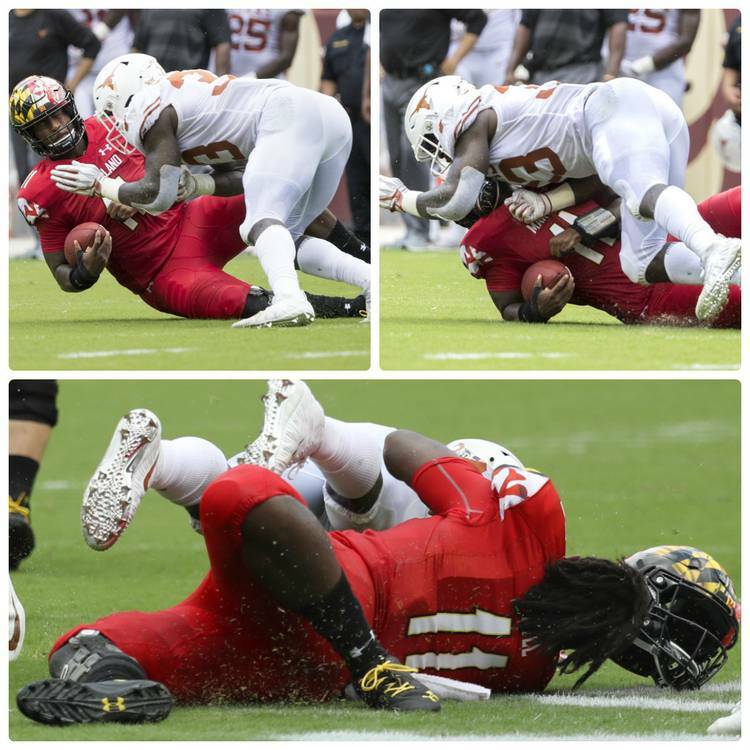 Against Maryland, it was senior linebacker Gary Johnson, who was disqualified for a second-quarter tackle of Maryland quarterback Kasim Hill. Johnson connected on a helmet-to-helmet hit with a sliding Hill. Texas coach Tom Herman, while supporting the safety aspects of the rule, argued Monday that intent should factor into the decision to eject a player. He contended that Johnson had set himself up for a low tackle of Hill, but the quarterback’s decision to slide put his head in the line of fire. During the first week of the season, SMU linebacker Trevor Denbow and Texas Tech defensive back Desmon Smith also were removed for targeting penalties. Texas A&M had two defenders kicked out against Northwestern State. After Michigan safety Josh Metellus was called for targeting, his replacement was subsequently torched for a 43-yard touchdown in a 24-17 loss to Notre Dame. UT coaches will continue to instruct players to go low on tackles, Herman said. Defensive end Charles Omenihu said that defenders just have to play smart and “you’ve got to understand when the quarterback is sliding that they are going to protect the quarterback.” The Longhorns, though, don’t expect to change their mindset on the field.